At Universal Healthcare Careers College, we believe your education should lead to a valuable and rewarding healthcare career helping others. At UHCC, you will receive hands-on training from experienced healthcare instructors in a small class size environment. Choosing a career path is one of the most important decisions you will make. Universal Healthcare Careers College in Los Angeles offers an exclusive program where students gain the skills and knowledge necessary to start a career as a Medical Assistant, Pharmacy Technician, and Medical Billing and Coding Specialist, all in one program. Universal Healthcare Career College’s exclusive 3-in-1 program lets students decide which program best meets their career goals while attending classes rather than having to choose a specific program prior to starting school. While attending classes at UHCC and learn more about each career field, you can decide if you want to pursue your career as a Medical Assistant, Pharmacy Technician or as a Medical Billing & Coding Specialist. 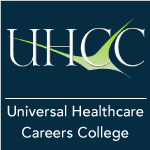 At Universal Healthcare Careers College, you will receive the training necessary for entry-level positions in hospitals, medical centers, physician offices, skilled nursing facilities, private pharmacies, outpatient clinics, insurance companies, and pharmaceutical companies. By submitting this form, I expressly consent to be contacted by Universal Healthcare Careers College with materials for educational services via telephone or text message. I understand that the calls and messages may be transmitted using an auto dialing system.